Sharon Jones and the Dap-Kings have come a long way since their humble beginnings nearly a decade ago. Steeped within the gilded and gritty sounds of gospel, soul and funk, this nine-piece Brooklyn collective has continued to electrify fans, disc jockeys, critics, record collectors, and bloggers the world-over with their authentic, heart-felt sound. The authenticity clearly demonstrated on the band's three critically-acclaimed albums Dap Dippin' (2002), Naturally (2005) and 100 Days, 100 Nights (2007) captured and released by the independent Daptone Records. Their albums recall an analog era led by iconic studios like those at Motown and Stax Records, and have thrust the fifty-three-year-old Augusta, GA native and crew into the multimedia limelight. Sharon Jones and the Dap-Kings have appeared on CNN, Good Morning New York, MTV News, VH1, Conan O'Brien, Craig Ferguson, David Letterman, Jimmy Fallon, BBC Television, NPR radio shows like Morning Edition and Fresh Air with Terry Gross, and have been covered in a slew of publications, from personal blogposts all the way to feature stories in the New York Times Sunday Magazine, Newsweek, the Associated Press, Interview, the Village Voice, and Entertainment Weekly. As distinguished as their recordings may be, however, Sharon Jones and the Dap-Kings have truly become renowned thanks to their incredible live show, not to mention their relentless touring. And though it's certainly no easy task to keep such a vast ensemble on the road, the band continues to pack hundreds of clubs worldwide, from legendary venues like New York's Apollo Theater, Beacon Theater and Central Park's SummerStage to their show-stopping sets at Coachella, Lollapalooza, Roskilde, Bonnaroo, Austin City Limits and WOMAD. But besides the adoration they receive from fans across the globe, their polish and zip has also grabbed the ears of a diverse range of producers, musicians, and Hollywood execs, leading to a number of exciting collaborative projects with many different artists. Ms. Jones celebrated her silver-screen debut in the Denzel Washington-led film, The Great Debaters, in which she acted, sang, and recorded the majority of the movie's soundtrack; the band's version of Shuggie Otis's 'Inspiration Information' was one of the favorites on the celebrated Dark Was The Night benefit album; and their cover of 'This Land Is Your Land' prominently featured in the Golden-Globe nominated Up in the Air. In addition, Sharon has hit the studio and stage with the likes of David Byrne (including in his upcoming Here Lies Love), They Might Be Giants,Rufus Wainwright, Lou Reed and Michael Bublé. Not to be outdone, the Dap-Kings' musical chops have also been in high-demand. Legendary soul icon Al Green tapped their services for his Grammy-winning Blue Note release, Lay It Down; Public Enemy beatmaster/producer Hank Shocklee made use of them for the soundtrack for the feature film, American Gangster; and Mark Ronson utilized them for much of Amy Winehouse's GRAMMY-winning Back to Black (one of those GRAMMYs went bandleader/producer/label impresario Gabe Rothfor his engineering work, too). 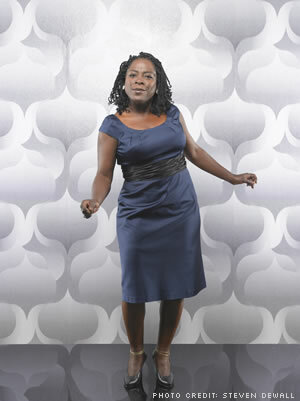 On May 4th, 2010, Sharon Jones & the Dap-Kings will mark history with ther fourth album I Learned the Hard Way. Produced by Bosco Mann and recorded in its entirety on an old Ampex eight-track tape machine by Gabriel Roth in Daptone Records' House of Soul studios, the record drips with a warmth and spontaneity rarely found since the golden days of Muscle Shoals and Stax Records. Sharon's voice, never stronger, evokes at once the raw power of Tina Turner, the moaning soulfulness of Mavis Staples, the rhythmic swagger of James Brown, and the melodic command of Aretha. From the lush Philly-soul fanfare that ushers in 'The Game Gets Old' at the top of the record, to the stripped down Sam Cooke style 'Mama Dont Like My Man' at the tail, the band dances seamlessly through both the most crafted and simple arrangements with subtlety and discipline. This is the 'Daptone Sound' at its finest and is a welcome breath of fresh air. But most of all, Sharon Jones & the Dap-Kings' I Learned the Hard Way is a celebration of, and a testament to, the soulful and beautiful possibilities of music.